It’s been a summer of major upheaval for the Shrews after coming so close to winning promotion to the Championship last term. They were just one game away in fact, facing Rotherham United in the play-off final at Wembley, going down 2-1 after extra time. Defeat saw manager Paul Hurst end his 19 months in charge as he went to Ipswich on a three year deal, the club moving to appoint Macclesfield chief John Askey in his place after he led the Silkmen back to the Football League. They lost some big hitters too, with Jon Nolan and Aristote Nsiala both following their former boss to Portman Road, while Joe Riley, Stefan Payne, Junior Brown, Abu Ogogo, Alex Rodman and Craig MacGillivray all departed. Reinforcements were needed and arrived in a hefty number, well over 10 new faces in fact, including Anthony Grant from Peterborough, Colchester’s Doug Loft, Josh Laurent from Wigan and former Hatters Alex Gilliead after his release from Newcastle United, plus Lee Angol. They also splashed some cash, bringing in Tranmere Rovers midfielder Ollie Norburn on a three-year deal for an undisclosed fee. Naturally, it is taking time for Askey and co to get settled at the New Meadow, with a tough start to the League One season. They went down 1-0 at home to Bradford on the opening day, lost 2-1 at Charlton and then went out of the Carabao Cup, 2-1 at home to Burton Albion. Since then they have picked up a first point, drawing 0-0 at home with Blackpool, following that up with another stalemate at Doncaster on Tuesday night. Goals have proved hard to come by, with just one in the league so far, but new signing Luke Waterfall believes that will swiftly turn around, telling the club’s official website: “We have had a couple of decent performances and a couple of clean sheets, which always helps. “The ball just won’t hit the back of the net for us at the minute, I’m sure it won’t carry on forever and the goals will definitely come. On facing the Hatters, Waterfall, who joined from Lincoln in the summer, continued: “Luton is a tough place to go. I played there last year. “They will be a good side, but we will go there full of confidence, knowing that we can go and win the game. Team news: Luton will be without Alan McCormack as he continues to recover from a calf injury, while Luke Berry won’t be risked just yet. Milestones: Jack Stacey is in line for his 50th appearance for the club. The 22-year-old signed from Reading last summer, with Town turning down a number of bids from Championship side West Bromwich Albion during the recent transfer window. It will also be a half century of matches for James Collins, the striker joining at the same time as Stacey, and has netted 20 goals for Luton so far. Top goalscorer: Hatters – Danny Hylton (2). Shrews – Lenell John-Lewis, Shaun Whalley (1). Man in the middle: Carl Boyeson. Experienced official has taken three games so far this season, showing 13 yellows and no reds. Officiated 37 matches last term, with 100 cautions and 10 dismissals, sending off two players in a game twice. Took Luton’s trip to Chesterfield, the visitors losing 2-0, which was his first Hatters involvement since the 4-1 win over Exeter in May 2016. Had a number of Town games earlier in his career, the 3-0 FA Cup win over Rotherham in December 2009 and 2-1 home defeat to Exeter in League Two in March 2009. Refereed another four matches before that too, spanning from 2002-2007, Luton beating Nottingham Forest and Oldham, drawing with Sheffield Wednesday and losing to Swindon. In charge: John Askey. 53-year-old who was a cult hero at Macclesfield, making over 500 appearances and scoring more than 100 goals during 19 years with the Silkmen. Stayed on as coach after retiring in 2003, having a brief stint as manager, demoted to assistant when Brian Horton took over, but stayed on in the backroom staff, taking the reins for a second time in April 2013. Led Macclesfield to the 2017 FA Trophy Final, losing to York City, before winning promotion back to the Football League last season as champions. Appointed Shrewsbury manager in June this year, signing a three year contract. View from the opposition: John Askey talking to the club’s official website: “The atmosphere can be quite volatile. But when I’ve gone with other teams we’ve done quite well. “We’ve got to go there and try and keep the crowd quiet and put in a performance like we did against Doncaster. “The main thing is to stay in the game for the first 20 minutes. If you can do that we’ve got a good chance. “Luton will be a good game and a good atmosphere. They’re on the up. They’ve got the momentum. That’s a big thing, players are used to winning. Friendly faces: Winger Shaun Whalley was released by Luton in controversial circumstances during June 2015 after playing 42 times and scoring five goals. Surprisingly headed up a level to the Shrews, but has made a real success of his career at the New Meadow, playing 128 times and netting 23 goals, already off the mark this term in the 2-1 defeat to Burton. Striker Lee Angol left Luton without playing a first team game, heading to Peterborough in July 2015 for an undisclosed fee. Spent two years with the Posh, before joining Mansfield last season, netting 10 goals and was then snapped up by Shrews in the summer, where he is yet to score in two sub appearances. Winger Alex Gilliead was at Luton for four months in the 2016-17 campaign after arriving on loan from Premier League Newcastle United, playing 21 times and scoring twice. Cut short his stay and joined Bradford, making 58 appearances in two spells for the Bantams, heading to Shrews once he was released by Newcastle in the summer, playing five games so far. Shrews have one more former Hatter in their ranks, Anthony Grant, who had a loan spell at Kenilworth Road from Chelsea in the 2007-08 campaign. Played five times in League One, his final appearance ending with a red card against Bristol Rovers. Now 31, he has had spells at Southend, Stevenage, Crewe, Port Vale and Peterborough, before moving to the Shrews in August, with four appearances so far. In Luton’s squad is former Town favourite James Collins. The striker had two spells at the club, scoring almost 50 goals in three seasons between January 2011 to June 2012 and June 2014 to July 2016. On leaving for the final time, headed to Northampton and Crawley before moving to Luton last summer. Played for both: Dave Edwards. Born in Shropshire, Edwards came through the ranks at Shrewsbury, playing over 100 times in four years before joining the Hatters in June 2007. Made 26 appearances for Luton, scoring four goals, but with the club struggling financially, he headed to Wolves for £675,000 in January 2008. Played over 300 times during his almost decade at Molineux, before moving to Reading in the summer of 2017 and won 43 caps for Wales before retiring from international duty in March. One to watch: Josh Laurent. 23-year-old midfielder who signed from Wigan for an undisclosed fee in the summer. Started out at QPR and then headed to Brenford, where he was loaned to Newport and then sold to Hartlepool. 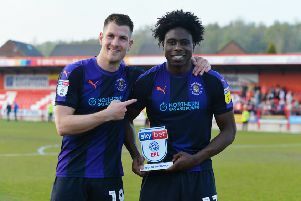 Went to Wigan from Victoria Park, spending last season on loan with Bury before moving to Shrews and has started all four games so far, named MOM in the draw at Doncaster on Tuesday night. We’ve got form: The Hatters have a splendid record over Shrewsbury at Kenilworth Road, as they are unbeaten on home soil since 1965. After the first match in 1964 before ended 2-0 to Luton, the Shrews got their revenge and in quite spectacular fashion with a thumping 7-2 Division Three success, although that remains their one and only triumph . Since then, Town have won five from nine, with four draws, making it an overall record of six victories, four draws and just the one defeat, scoring 20 goals, while Shrews have managed 14. Last time out: Luton were held to a goalless draw by Shrewsbury in their most recent visit to Kenilworth Road, that in January 2015. Jake Howells hit the post for Town in the first half and despite the visitors playing the final 20 minutes with 10 men, once Nat Knight-Percival had been sent off for his second booking, Luton couldn’t break through. In the visiting team that day was striker James Collins, while current Shrews winger Shaun Whalley came off the bench for the Hatters. Hatters: Mark Tyler, Michael Harriman, Scott Griffiths (Ricky Miller 80), Luke Wilkinson, Steve McNulty, Jonathan Smith, Andy Drury, Jake Howells, Luke Rooney (Shaun Whalley 64), Nathan Doyle, Jayden Stockley. Subs not used: Elliot Justham, Fraser Franks, Matt Robinson, Mark Cullen, Charlie Walker.